WHAT IT IS: Hero Quest is a board game by Milton Bradley that came out about 1990, which is sadly no longer available. It is a role-playing game that was simplified to a few simple actions (move, attack, search) and was played out on a wonderfully illustrated gameboard divided by squares. It had 4 heroes and 1 person to control all the monsters (called Zargon), and incorporated random elements by using cards and dice. The most attractive of its features were it's ease of play and some of the best 3-D plastic figures and furniture I've seen, that could be placed anywhere on the board. Hero Quest also spawned 4 quest packs (with additional figures) adding 40 quests to the original 12, but unfortunately Milton Bradley discontinued the line before it could really catch on. Games Workshop, a game company from Great Britain, followed with a game called Advanced Hero Quest, bringing more quests, furniture and figures (they were, in fact, the sculptures of the original figures), but that died as well. Games Workshop currently has a yet more advanced line of games called Warhammer Quest which, although similar to Hero Quest, does not have the sheer simplicity of play that Hero Quest had. A simplicity that is directly attributable to it's special dice, which is also no longer available. WHAT THIS PAGE IS ABOUT: What we (my brother and I) have been trying to do is return RPGs to the simplicity of play that Hero Quest had, but add elements it lacked. Using the standards set fourth by the original Hero Quest, we've added 6 races and 12 classes of characters each with individual advantages and disadvantages. As well as over 35 different monsters to encounter (with complete stats and abilities). In most cases we've tried to stay within the original rules, however minor changes were made for personal reasons (Gandalf used a sword, why couldn't our mage?). We have also tried to make it possible to play without a Zargon player to allow all gamers a chance to play the heroes. (Although, admittedly, it is less complicated and more fun with someone to play the bad guy.) PLEASE NOTE: As it is right now, this version of Hero Quest is NOT authorized by Milton Bradley. It is not posted as my own idea, or for profit of ANY kind. I am looking into the possibility to bring this version public but for now this is a private web page and items contained are for friends and family only. ALSO: Please do not steal any of the ideas contained here, we've spent far too many hours of planning to get this version to work smoothly. If all goes well, someday this may be made available to the public. WHAT'S NEW: New fetures include six races, twelve classes, strength and dexterity checks, and a whole new spellcasting system with new spells for the mage (and a new class, the cleric) as well as new spells for the enemies. There are more items to buy in the shops as well as new artifacts to find in the game. We have also made over 40 new beasts and monsters to fight against, from the simple rat or hobyah, all the way to a lich or a dragon! DISCLAIMER: The ideas contained on this page are designed to expand upon the Hero Quest game designed by Milton Bradley, all ideas are used without permission and are for personal use only. Major influences on this version of Hero Quest are Dragon Raid, Dragon Strike, and Warhammer Quest. Other influences: Advanced Hero Quest, Battle Masters, Dark World, DragonFire, Dungeon, DungeonQuest, Key to the Kingdom, Talisman, and of course Advanced Dungeons & Dragons. A special thank-you should also be said to Dr. Pepper Cola. All games mentioned are copywrite of their individual makers. Here are some Windows programs I created. (Potential employers: I am a VB programmer.) 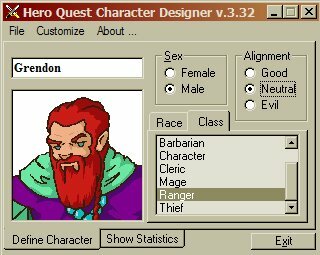 The Hero Quest Character Designer will automatically create a character sheet for printing for any character you make. It is highly customizable so you can add new information and change current stats. 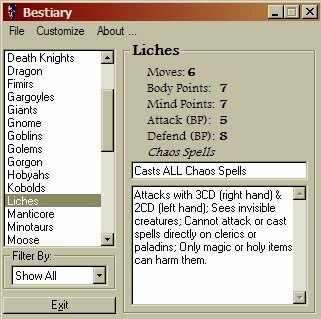 Beside it is the Bestiary program that will print out creature sheets for any monster you choose. It too is highly customizable so you can change anything you want. Updated data files for these programs can be downloaded, here. They are not necessary for them to run, they are just changed to suit my particular preferences. If you experience a Oleaut32.dll error, then you may need to replace your file with this one. An Excel spreadsheet summarizing all the beasts and their abilities can be downloaded here. For those of you familiar with my site, you may notice there is no longer a link to download the third program in the set, the Rules Browser. Because I spent so much time on the new rule book, I didn’t want to redo everything on that too. Besides, I discovered it wasn’t fully compatible with Windows XP. If you still want it, you can e-mail me for it.